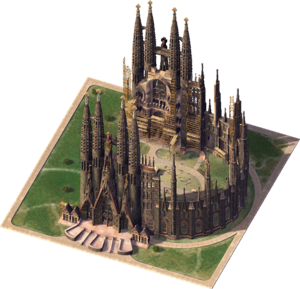 The Temple Expiatiori de la Sagrada Familia is a Landmark Building for SimCity 4 Rush Hour/Deluxe, released as the Plugin Pack 00F free Downloadable Content. It is a recreation of Sagrada Familia (full name Basílica i Temple Expiatori de la Sagrada Família) in Barcelona, Catalonia, Spain as it appeared in the 1970s, 1980s or 1990s. The full name in real life and that used in the game differs as it was consecrated as a Minor Basilica in 2010, seven years after the plugin was released. The News Ticker fluff entry created on its placement is "Sagrada Familia Strikes Locals as "Very Gaudi"". The building was originally going to be a 12x12 tile lot according to the exemplars. The reason it was scaled down to only the main building is not known.